Raunaq Chandrashekar is an analyst with BGA’s India office in New Delhi. He is responsible for monitoring and analyzing policy and closely following legislative and regulatory developments across multiple sectors. 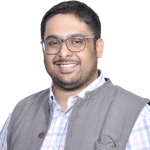 Prior to his position at BGA, Raunaq worked at the Vidhi Centre for Legal Policy as a Vidhi-Tata Trusts Fellow under the Justice, Access and Lowering Delays in India Project. He was involved in three crucial reports that examined judicial infrastructure, special courts and tribunals, with a focus on the backlog of cases in India’s judicial system and litigant access. Prior to this, Raunaq was a project associate with the International Innovation Corps (IIC), a social impact consulting program based out of the Harris School of Public Policy at the University of Chicago. As part of the IIC, Raunaq was embedded with the Irrigation Department of the Government of Telangana to develop a Participatory Irrigation Management (PIM) policy and implementation plan, meant for the state’s more than 45,000 minor irrigation resources. Raunaq graduated with a law degree from the National Law University (NLU) in New Delhi (India), where he was active in the Indian parliamentary debating circuit, having won over 10 varsity tournaments across the country. He has also interned with member of Parliament M.V. Rajeev Gowda for over two parliamentary sessions from 2014 to 2015 and was a teaching assistant for political science in his final year at NLU Delhi. Raunaq is a generalist with deep interests in law, policy and politics. In his spare time, he enjoys reading about politics and pop culture, traveling and watching live music.